← Snickerdoodles (Gluten and Grain Free)… The 10th Day of Christmas Cookies!! Winner of the Craftsy Holiday Cookie Contest for 2013!! 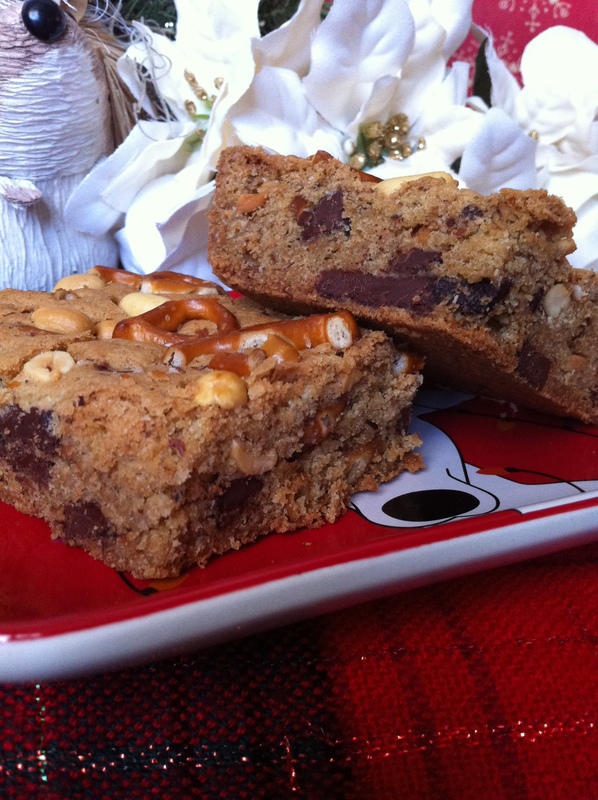 Bar Snacks Blondies (Gluten Free)… The 11th Day of Christmas Cookies!! 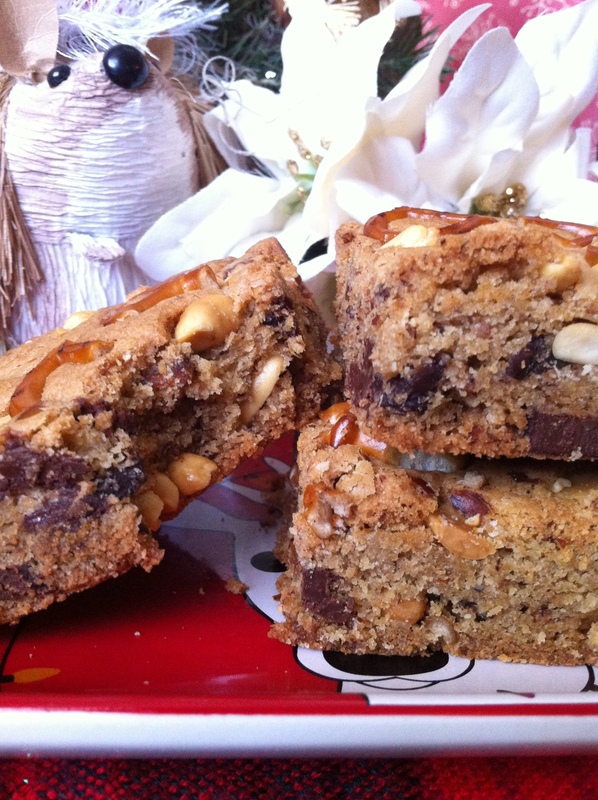 And now for something REALLY different… Bar Snacks Blondies*. 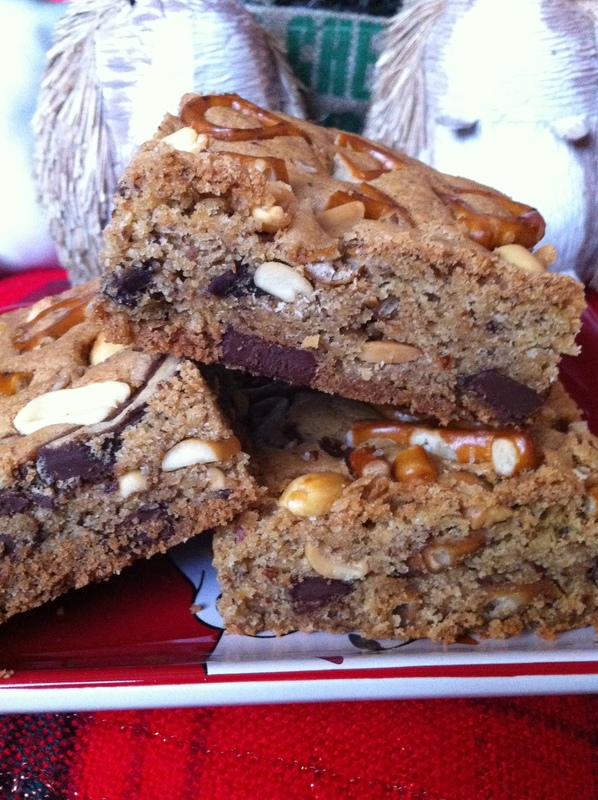 I’ve put your favorite bar snacks into a cookie bar! This rich blondie is packed full of pretzels, salted peanuts, and big chunks of semi-sweet chocolate, which is sure to please anyone that loves that salty/sweet dessert flavor. This sweet vanilla cookie base is punctuated by big chunks of chocolate that you chop yourself (as large as you want), and salty chunks of pretzels and peanuts. What a treat for the football crowd, watching the big game and munching on their favorite snacks all together in one easy cookie bar. This large 9″ X 13″ pan of blondies will disappear before your eyes. It is simple to put together, and will surprise and delight everyone that tastes it. With extra chunks of broken pretzel’s, and salted peanuts on the top, this cookie needs no frosting to make its own bold statement. *For those of you that are unfamiliar with the term “Blondie”, a blondie is basically a vanilla flavored brownie. It gets its name from the ‘blonde’ color of the dough as opposed to the darker chocolate color of a brownie. Preheat oven to 350. Spray a 9″ X 13″ pan with nonstick spray, and set aside. Cream the butter with the white and brown sugars until creamy and no lumps remain. Add the Vanilla extract, salt, and the baking soda, mixing completely. Stir in the eggs one at a time until fully incorporated. 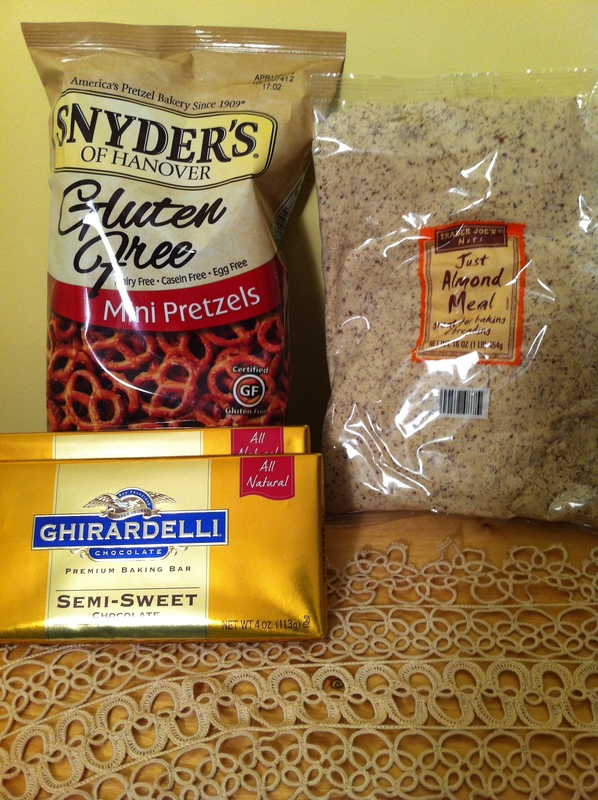 Stir in the almond meal or brown rice flour until mixed, then stir in the gluten free all purpose flour and Xanthan gum. Mix until all of the dough is uniform and thoroughly mixed. 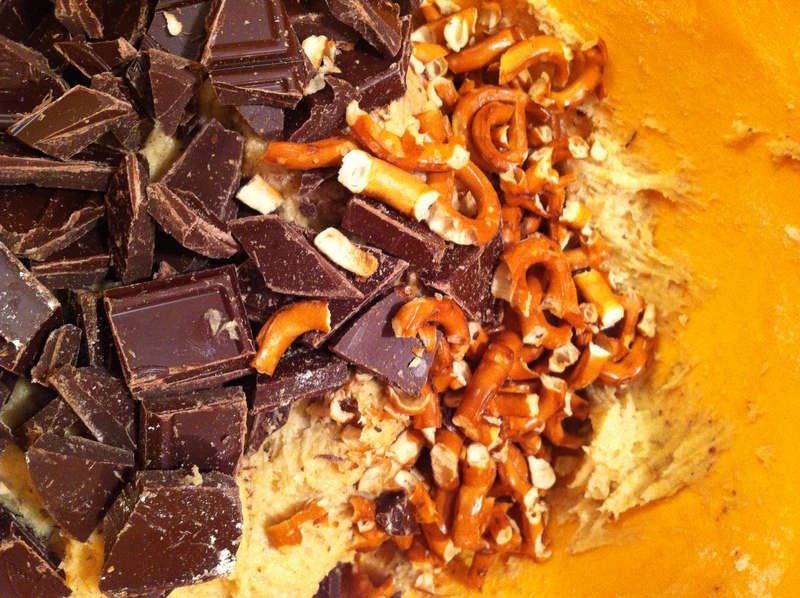 Fold in the chocolate chunks, pretzels, and peanuts. Place the dough in the refrigerator for 30 minutes to set. After 30 minutes, press the dough into the prepared pan with your fingers or a spoon. 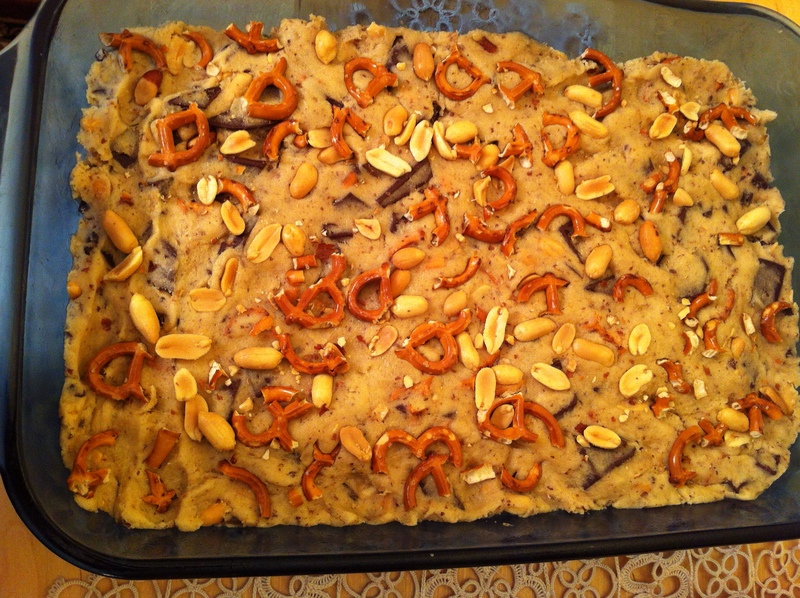 Sprinkle additional pretzel chunks and peanuts onto the top of the dough and press lightly to make sure they adhere to the top. Bake for 40 to 45 minutes, or until edges start to turn golden and cookie bar is set. These blondies give you everything from chocolate to vanilla, pretzels to peanuts, and sweet to salty. They are soft and chewy but also have the satisfying crunch of the pretzels and peanuts. This combination of opposites will make even the people that prefer salty over sweet, or crunchy over soft, stop and take a bite. 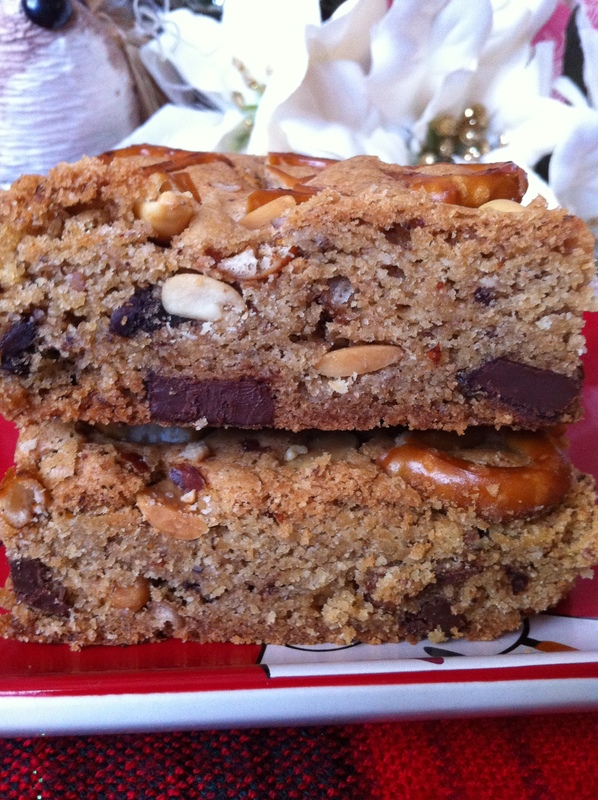 If your “goal” is to “score” big points for providing a versatile cookie/snack/dessert that will please those that can’t decide between wanting something salty or sweet, then this Bar Snack Blondie will be a huge “touchdown”. Enjoy! Thank you so much for the nice words. I hope you will keep coming back to see what is next on my blog! Happy Holidays!